The first leg of the race began with the La Verne City Track Meet held on an overcast Saturday morning, at Bonita High School on March 26, 2011. The La Verne elementary school Physical Education teachers work hand in hand with the city to identify viable candidates for this annual event. Those athletes placing in the first two positions, for each event advanced to the SGV (San Gabriel Valley) Finals, which were held on May 14, 2011. The SGV Finals not only included the La Verne qualifiers, but also included athletes from San Dimas, Duarte, Arcadia, Pasadena, Azusa and private track clubs like the Cheetahs of the Inland Empire. 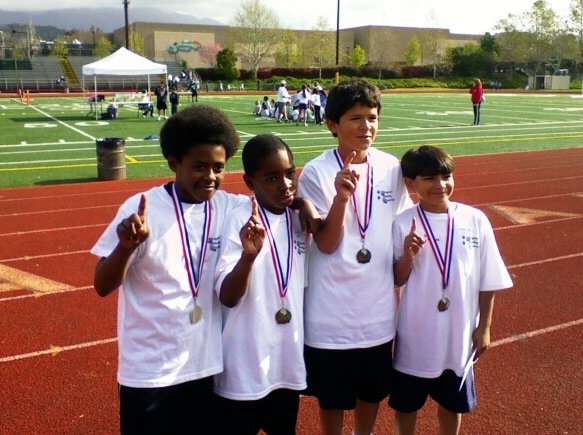 Though the competition was stiff, there were four Roynon students who advanced to the SCMAF Championship (Southern California Municipal Athletic Federation), to be held June 5, 2011 at Warren High School in Downey, Calif., for placing in the top four at the SGV Finals. SCMAF is a state-recognized organization founded in 1949, which not only promotes youth Track & Field opportunities but also has established training and competitive venues in baseball, basketball and football. The Roynon team is under the direction of Physical Education teacher Kim Jeter, who has done a fine job coordinating the efforts of these athletes. The Roynon students who competed at the SCMAF Championships were fourth-grader Sami Riggs, who placed third in the Girls 800 meter run and second in the Girls 200 meters; fourth-grader Grader Devvin Gitchuway, who placed second in the Boys 100 and 200 meter events; third-grader Aleeza Roy, placing fourth in the Girls 100 meters; and third-grader Alex Bernal, who placed fourth in the boys’ long jump. Honorable mention went to the fourth-grade boys’ and girls’ 4 x 100 meter relay teams, who placed second and third respectfully in their divisions. Moving up through the various levels of competition to ultimately participate in the SCMAF Championship is not only an honor but quite an accomplishment for these students. Congratulations Roynon Runners. You are all winners, and we are proud of you!